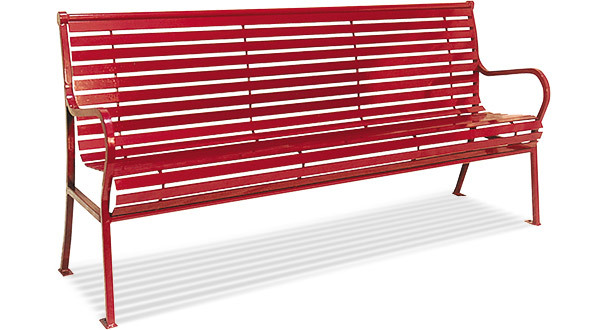 The modern stylings of the 4' and 6' horizontal slat park bench from the Hamilton Collection is a popular choice for attractive public seating. Engineered for all-weather use, designed for comfort—the gently curved seat and back is constructed with 1/4" solid steel slats and reinforced with thick support ribs. The strong, minimalistic 1" solid steel frame is MIG welded to the bench seat to provide optimum support. Finished in a resilient powder-coating offered in an array of colors making it easy to complement a variety of indoor or outdoor spaces. For maximum accommodations the Hamilton Bench Collection features an optional center armrest and with or without side armrests.